TNUSRB SI Taluk Question Paper- Interested applicants who wish to appear for the TNUSRB SI Examination can prepare for the test with the help of the TN SI Exam Model Question Paper with Answers PDF. Candidates can start their preparation for the TNUSRB SI Exam 2019 from our page as we have given the Tamil Nadu Si Exam Question Paper PDFs for you to download. This will give you a general idea of what will be asked in the recruitment exam. It will also give you a brief about how the different subjects will have different weightage in the examination. Additionally, contenders will also be able to gauge how much time they should allot to each section in the test paper. This will enable you to complete the question paper ahead of time. These PDFs have been taken from the official website of the Tamil Nadu Uniformed Services Recruitment Board which is www.tnusrbonline.org. More papers will be updated on our page for free download in a short while. We urge you to bookmark this page so that you don’t miss out on any of the latest papers we upload. Furthermore, you can practice the papers according to the different subjects. This will help you sort the topics according to the difficulty level. Another division in two types of papers is- Departmental and Open category. The paper for each of these categories differs according to the syllabus and exam pattern. All the information has been given below. The TNUSRB SI Recruitment 2019 is an amazing opportunity for candidates to secure a police job in the state. You are advised to not miss this chance by going through these TNUSRB Model Papers and practising them. Now that you have gone through the point of this page, let us move onto the details article. You will be able to download the papers at a mere click once you go through this segment entailed below. The link given will take you to the respective Google Drive folder and you can download the PDF from that folder. The next step obviously would be to save it onto your personal computer or mobile and you will be free to utilize these papers whenever you wish. So, given below are the TNUSRB SI Taluk Previous Year Question Papers. After or before going through the mock question papers, you will realize that you need to be familiar with the portion of the recruitment exam as well. This information will be vital in the preparation of the recruitment exam which is planned to be conducted. Furthermore, we have also added a PDF which will be of great help to you when you wish to prepare offline. 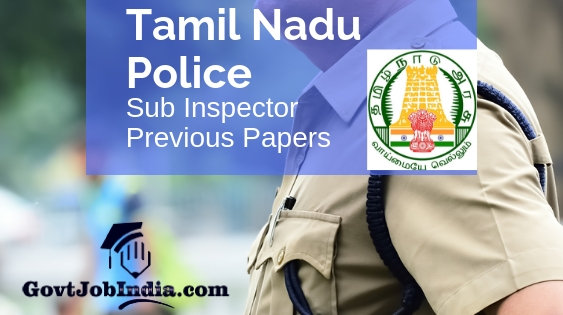 You can view the Tamil Nadu Sub Inspector Syllabus and Exam Pattern 2019 here. How did you find the article about the TNUSRB Sub Inspector Recruitment Previous Question Papers 2019? Was this article informative enough for you? Did you think that the PDFs were worth practising? If yes, share this article with all those candidates who wish to prepare for the TNUSRB SI vacancy exam 2019. In addition, all doubts, needs and requirements can be left in the comment section. We will get back to them as swiftly as we can. Winding up, remember to subscribe to our website @ GovtJobIndia.com for the latest news about any new govt recruitment in Tamil Nadu or any other part of the country.